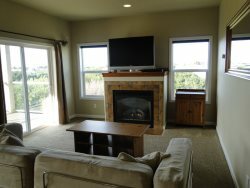 This brand new home is Ocean Front in Ocean Shores on Agate beach 4 miles south of downtown. Come sit back and relax and enjoy the outrageous ocean views. All homes do require the first night plus tax for deposit. This deposit is non-refundable. If you cancel, this deposit IS NOT returned. There is a 2 night minimum stay, 3 nights during the holidays. All homes have a cleaning fee. There is a 2 car limit at this home. You must be at least 25 yrs. old to rent one of our properties. Sleeps 4 1 Bedroom /1 Bath Bedroom has queen bed, living room has a pull out sofa Full Kitchen TV / DVD Player Cable TV Wireless Internet. Washer/Dryer, Ocean Front Smoking is strictly prohibited. One small dog 20 pounds or under. Check in was great and had fun talking with them while doing the check-in paperwork. The Driftwood Cottage was fantastic! Clean and amenities were spot on. Loved the tiny house vibe! The Driftwood cabin was perfect for a two-night getaway. It appeared to be brand new. Everything was in tip-top shape. The setting, with pathways to the beach through a tall grass meadow, was idyllic; romantic, like something out of a movie. The porch was a great place to sit and talk as the sun set. Perfect. Friendly helpful staff. Easy checkin and checkout process. The cottage was lovely! Bright, sunny, clean and comfortable! Staff was very accomodating in arranging for early check-in. Very easy to drop by and pick up keys when the property was ready, soon after previous guests checked out. Lovely and cozy little cottage with wonderful setting. Very clean, comfortable and well supplied. Our brief stay was very enjoyable. This place is adorable. Just the right size for puppy and myself. We enjoyed sitting on the back porch listening to the waves. I would definitely stay here again and would recommend to my friends. Very helpful left very detailed instructions to cottage and very nice leaving key after hours for me. What a amazing house with the best sunset view you can find! We have stayed in ocean shores at many different hotels. But we will never again after staying at the cottage it was perfect. Everything about our stay went smoothly. Driftwood cottage was a wonderful cozy retreat! Exceeded our expectations! Such a great time at Rick's rental house. Clean, cozy and so convenient. The beach is steps away! Both times we have stayed at your properties the check in procedure was so easy, even when we were running late from a flight into SeaTac your staff made sure we were set up for after hours. Stayed with your properties 2 times in the last year and the experience was perfect both times. The property was everything we expected. Thanks. We arrived 10 minutes before closing and the clerk was so nice and check in was an ease. entire experience perfectly met our expectations. perfect vacation rental for a relaxing weekend at the beach! Perfect vacation cottage for our family. Thank you! We enjoyed our stay at the Driftwood Cottage. It was well maintained and exceeded our expectations for a rental beach home. Tammy was very welcoming, friendly; and extremely helpful throughout the process. The property was very clean, well-kept, described accurately on site. Cute cottage, pretty private beach area is just right there. We had a great time & would definitely recommend this property & the company that manages the rental. They make everything extremely easy & smooth. Thank you!! !